RCPI Kirkpatrick Award for history of medicine research The Royal College of Physicians of Ireland are delighted to launch the sixth annual Kirkpatrick Award for history of medicine research. The award will be made as part of the Heritage Centre Lectures at the annual St Luke’s Symposium on Thursday 20 October 2016. 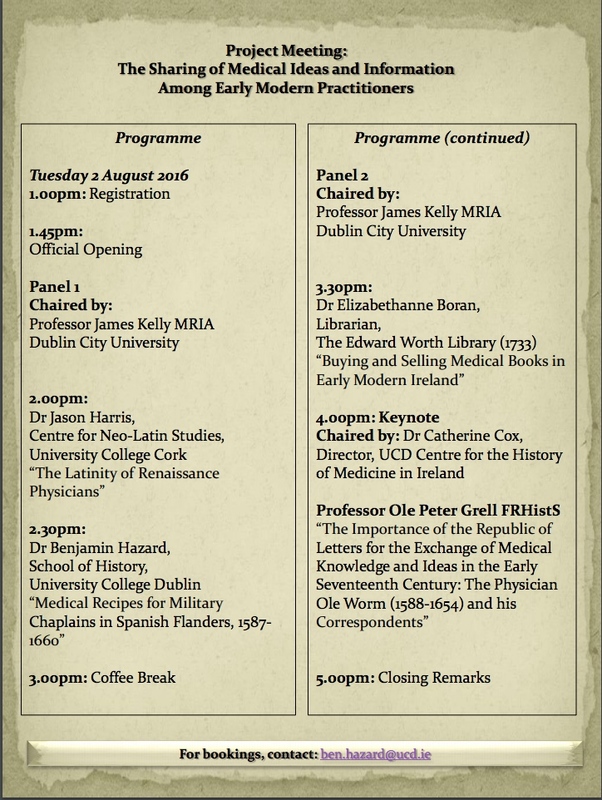 The Kirkpatrick Award aims to encourage and promote the study of the history of medicine in Ireland. The award prize is €500. The Kirkpatrick Award is open to all researchers in the field of the history of medicine in Ireland, as well as related social and cultural history fields. The purpose of the award is to support and develop the study of the history of medicine in Ireland and to promote the use of the library, archive and heritage item collections held by RCPI. Applicants are asked to submit an abstract based on their research (maximum 800 words) with a copy of their CV, by Friday 9 September 2016. Research must be unpublished and must have been undertaken in the last three years. Research that has been submitted for publication will be considered, but details should be given of when and where it has been submitted, and if it has been accepted for publication. A judging process will commence in September which will conclude with finalists presenting their 15 minute research papers on Thursday 20 October 2016. Please contact heritagecentre@rcpi.ie with any questions or to submit your application. Submissions are welcomed for a volume focused on science, technology, and Irish literature of the revival and modernist period. The deadline for initial proposals is August 15th. Since W. B. Yeats infamously wrote in 1890 that “the man of science is too often a person who has exchanged his soul for a formula,” the anti-scientific and Luddite bent of the Irish literary and cultural revival has often been taken as a given. Recent scholarship, however, has questioned this perspective and has begun to tease out a more complicated vision of Irish writers’ relationship to scientific and technological development. This collection seeks to provide a more nuanced view of Irish writers’ engagement with science and technology as well as the relationship between Irish revival writers and Irish modernism. It aims to capture not only the varied ways that Irish writers were plugged into the scientific and technological impulses and networks of the age but also the myriad outcomes of their representations – the ways that they shaped modern Irish attitudes, aesthetics, ideologies, and more. We welcome submissions on canonical and non-canonical authors, as well as those that interpret the category of “literature” in new ways. We also welcome submissions from both emerging and established scholars. The editors seek 250-500 word proposals for original contributions and a 100-word biography (included selected publications) by August 15, 2016. 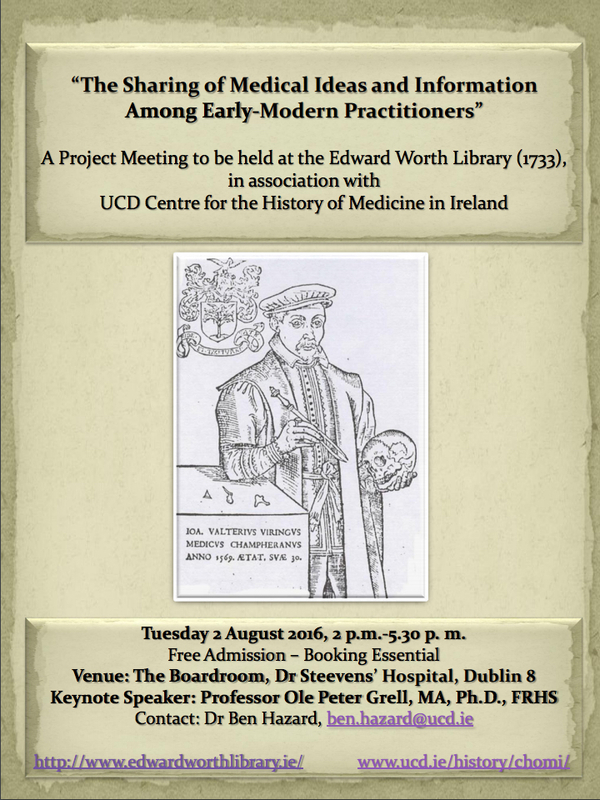 Held in The Edward Worth Library in association with the UCD Centre for the History of Medicine in Ireland, Tuesday 2nd August 2016, 2-5:30pm. With keynote lectures by Catherine Cox and Ole Peter Grell. Free Admission but Booking essential. For Bookings contact Dr. Ben Hazard .